The first time I saw the name Inverness is when I read William Shakespeare’s Macbeth. Many people assume that all English teachers just love Shakespeare. I’ll tell you a secret. Not all of them do. However, I always have loved reading, watching, and teaching the works of Shakespeare. As an undergraduate at the College of Charleston, I had the option to take a survey course on the tragedies or a course on the histories and comedies to get my English major. I took the tragedies one semester to fulfill the requirement, and then I audited the histories and comedies for fun the next semester. So, yeah. I love Shakespeare. And, so I knew if I ever came to Scotland that I would come to Inverness. When I arrived on the train in the early afternoon, I hustled to the hostel, locked up my gear, and started walking. Inverness is more of a traditional port city than Edinburgh from what I saw, and it is certainly less cosmopolitan. The air was colder, the sky was grayer, and there was intensity. A lot of people just seemed about their business. My first interaction with a person on the street was a bit dodgy. I had crossed the River Ness and was entering a series of working class tenements. I saw a pair of young men, drinking and smoking, heading up the opposite side of the street. One of them looked like he could have been an extra in Trainspotting. “Oi! You know how to get to — street?” he yelled to me. I barely made out the question, and I had no idea about the street. So, I said I didn’t know. He seemed angry, and, for the first time, I thought I might be in a brawl. The pair continued on as the gangly one continued to express his displeasure of my lack of geographical knowledge. Needless to say, I was a little on edge after that. Colin is an Inverness local who made me feel welcome and directed me to the Merkinch Local Reserve.. But then I thought about port towns and I also thought about my quest: to seek the best in people. I decided to push on until I reached the water’s edge and found someone who was more agreeable. I found both at the edge of Beauly Firth. 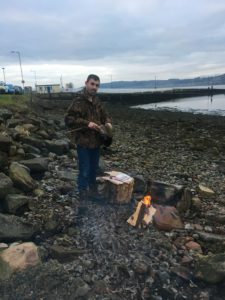 I saw a man standing on a rocky shore next to a fire cleaning a pheasant. I walked up an introduced myself. He told me his name was Colin. He helped me orient myself. He told me that he was in a hunting syndicate and that he had been hunting that day across the water to the north. I told him about the blog and asked if I could take his picture. He agreed and smiled as he continued working away at the feathers. I did, and I’m so glad I did. In that one moment with Colin, I relaxed, and Inverness revealed her beauty to me. The Merkinch Local Nature Reserve is a lovely bogland right at the edge of the coast. There is a straight path that leads to the Caledonian Canal at the other end of the reserve, but there is also an offshoot that occurs midway. 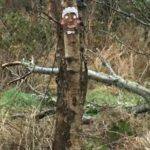 The trees have faces in Merkinch. I, of course, turned down the offshoot. In the bog amid the trees and grass, I found some interesting clay figurines melded into the trunks and limbs. A superstitious person might have thought witches had been here, but the figures and symbols were too playful to be threatening. I wondered if a first grade teacher had led her class into the reserve to add their own piece of magic to nature. When I crossed the rest of the reserve, I walked out to the edge of the canal, which offered some amazing views of an expanse of water that stretched between hills and mountains on all sides. After taking some pictures, I headed back towards the town’s center. 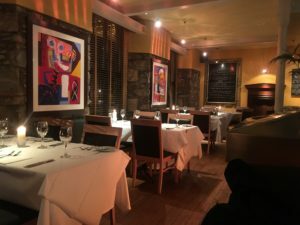 The Mustard Seed is located next to the River Ness and offers highland cuisine with a cosmopolitan flair. Earlier in the walk, I had seen a restaurant called The Mustard Seed and found myself intrigued by the name. My first thought was Shakespeare’s A Midsummer Night’s Dream. I was hungry, so I decided to give it a go. I had been to some pubs in Edinburgh along Haymarket, but I had yet to go to a more upscale restaurant. The Mustard Seed has a more cosmopolitan feel to it. There is interesting modern art on the walls, there is track lighting, and the bar itself looks like an art piece. The restaurant manager, Neil, told me that the name of the restaurant actually came from Jesus’s Parable of the Mustard Seed (Matthew 17:20) and that the building actually used to be a church. I looked up at the high ceiling, at the second floor that surrounded, and I could see the signs of the transformation. Neil suggested the highland beef with haggis and mashed potatoes served with a side of grilled vegetables. He told me that all of their meats and vegetables were locally produced and that the butcher who cut prepared the meat had also had prepared the haggis. So, that’s what I ordered and enjoyed with a 16 year old Langavulin scotch. The peatiness of the scotch and the tenderness of the perfectly cooked beef was a lovely combination. I thought about my initial response to Inverness, a city that I always associated with one of Shakespeare’s bloodiest plays, and I realized how unfair it had been. I can’t wait to see what Scotland shows me tomorrow.